KMC BOSSES CHARGED WITH SH12MILLION FRAUD. 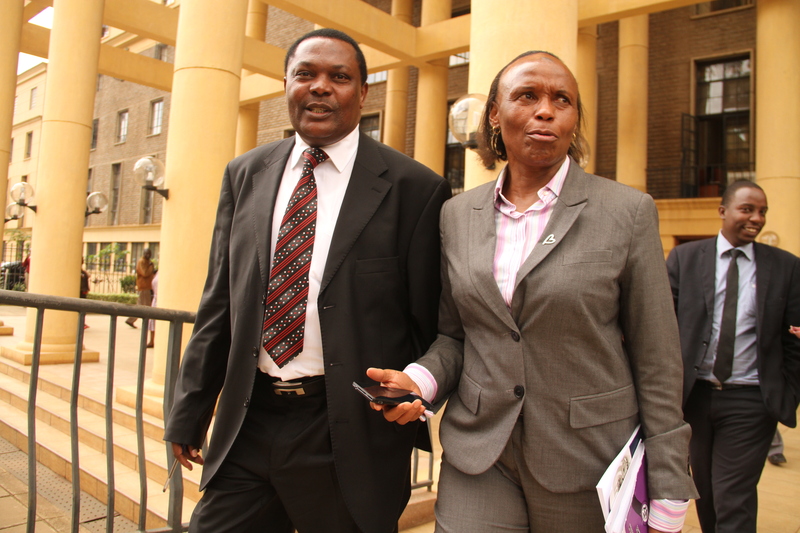 Former Managing commissioner, Ibrahim Haji Isaak, deputy commissioner and finance manager Patrick Sau Mutemi, Esther Njeri Ngari, Francis Musau Mutuse and Ruth Muthoni Mwangi when they appeared before a Nairobi Anti-corruption Senior Principal Magistrate Lawrence Mugambi on Thursday 28,05,2015. Former Kenya Meat Commission Managing Director and other four senior officials were on Thursday arraigned before a Nairobi Anti-Corruption Court facing conspiracy to defraud the state agency over sh 11.5 million. However the six officials did not plead to the charges because their lawyers made an application seeking the plea be differed to enable them have more time to study the charges labbelled against their clients claiming they had been served with the summons in a short notice to appear in court. 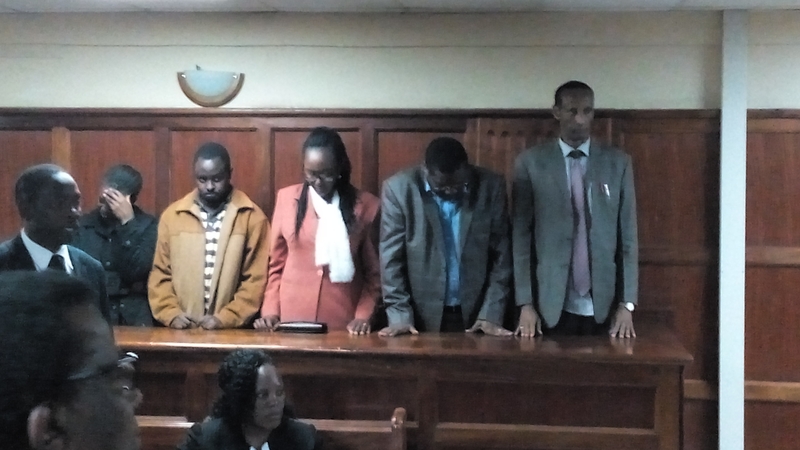 The six officials are facing charges of conspiracy to commit an economic crime and conspiracy to defraud Kenya Meat Commission sh 11.5 million contrary to the law. The former Managing commissioner, Ibrahim Haji Isaak, deputy commissioner and finance manager Patrick Sau Mutemi, Esther Njeri Ngari, Francis Musau Mutuse and Ruth Muthoni Mwangi appeared before Senior Principal Magistrate Lawrence Mugambi. The sixth accused person, former chief accountant Evans Nyaiyo Bikundo was not in court. His lawyer told the court that the accused was in Nigeria and no summons had been issued to him to appear in court yesterday. Nyaiyo is also facing a warrant of arrest in a similar case in Kajiado where he is being charged alongside Ibrahim Haji Isaac and Irene Mbito, the former legal affairs manager. His lawyer requested the plea to be deferred for one month to enable him arrange his coming back from Nigeria. Haji’s lawyer also requested the plea to be deferred to a later date suitable to the court as they had been issued with summons in a short notice after coming back from a similar case in Kajiado where he was released on sh 500,000 cash bail. The four other lawyers also filed the same application stating that it would be appropriate for all the accused to take plea together. State prosecutor Emily Kamau opposed their plea deferral application stating that the counsels were seeking adjournment through a back door. She stated that all the accused persons knew that the Anti-graft body was investigating them and thus should have been prepared for the plea. She also stated that all the accused persons were served with summons on time. She objected the application made Evans Nyaiyo’s lawyer stating that no proceedings should take place in the absence of the accused person. Emily requested the court to issue a warrant of arrest to him. “I object the deferral of the plea as no good reasons have been tabled by the counsels. The issue they are raising now should be raised during the hearing which is after the accused have taken plea,” she said. In his ruling, Senior Principal Magistrate Lawrence Mugambi said that there was no prejudice the state will suffer if the plea will be deferred. He however issued summons to Evans Nyaiyo to appear in court while other accused persons will be taking plea. The five accused persons were released on a Sh 100,000 cash bail or a Sh 500,000 bond with one surety of a similar amount. The case will be mentioned on June 9 when the accused are expected to appear in court to answer to the charges preferred against them by the Anti-graft agency body. 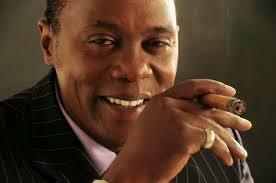 Jeff Koinange faces fresh contempt of court charges after a warrant of arrest was issued this afternoon. A court sitting in Nairobi’s Milimani, found that the Jeff Koinange Live Show host had not honored his bail terms and a Sh 100,000 bond was cancelled. The warrant was issued for failing to attend court on Monday morning. Senior resident magistrate Maisy Chesang who was to hear the case, ordered Koinange’s immediate arrest. Last week, the Peabody Award Winning journalist was arrested at his home and charged with contempt of court last week, was released on a Sh100, 000 cash bail after he failed to appear in court over a defamation suit. Koinange was charged along businessman Tony Gachoka for discussing a case on TV despite being ordered not to. The lawyers last week managed to secure Koinange bail and said he would not abscond court sessions. Political analyst Tony Gachoka was however present in court on Monday. Koinange and Gachoka were sued by business tycoon Jimi Wanjigi for allegedly linking his firm, Kwacha Group of Companies, to the Anglo-Leasing scandal. They allegedly uttered defamatory statements linking the company to the scam during Koinange’s TV show in May 2014 and March this year. A woman suspected to be a terrorist was on Monday arraigned in court and charged of being in possession of a document used in instigating terrorism activities in the country. Anab Abdullahi Sheikh, a mother of an 8 months child, appeared before Milimani Chief Magistrate Daniel Ogembo and denied the charges. She is alleged of committing the offence on April 29, 2015 at Matuu town within Machakos County. She is accused of being in possession of a Tecno Mobile phone with an 8GB Micro SD memory card that had a video namely Banan Bax Mujahidiinta which was an article for the use in instigating the commission of a terrorist act. Sheikh was also charged with being in possession of another video namely Sheikh Hassan which was an article for the use in instigating and commission of a terrorist act contrary to the law. She was accused of being in possession of another video written Abu Xudeyfa which was an article for the use in instigating the commission of a terrorist act which was in contravention of Prevention of terrorism act. The prosecution did not oppose her application for bail. She was released on a bond of Sh 10 million with one surety of a similar amount or a cash bail of Sh 500,000. The case will be heard on June 26. Deputy Solicitor General Muthoni Kimani walks out of court with her Lawyer Kioko Kilukumi after High court directed that he will deliver a sentence on June 15, on contempt of Court charges against her. Kenya’s Deputy Solicitor General will now be sentenced next month after being convicted of contempt of court. High Court will give the final verdict against Muthoni Kimani for failure to obey an order to pay City lawyer Gitau Mwara Sh 6.5million. Muthoni told the High Court Monday morning that she had already paid the lawyer Sh6.5 million including the accrued interest. Defense Lawyer Kioko Kilukumi pleaded with the court to grant Muthoni a suitable fine on the grounds that she had been an advocate of the High Court for 30 years. “Muthoni was not served with the orders until she was served with court summons requiring her to appear in court in person for the ruling,” said Kilukumi. Muthoni is accused of disobeying a court order issued on May 3, 2013 but defends herself that it was a failure on the side of the state officials. The amount was allegedly paid on May 19, 2015. The complainant Lawyer Mwara acknowledged that it was indeed paid through an Attorney General’s office. Kilukumi said if his client knew of the application, she would have earlier presented the materials to show that payment process had been initiated. Kilukumi said the power to sentence only lie with the Judge and prayed for a reprimand or a fair sentence. The defense also pleaded with the court to put the matter to rest claiming that the sentence must fit with the circumstances in which the offense was committed. The Deputy solicitor’s counsel said there was no intention to withhold the money as she has a mandate of protecting public fund. The case which is filed at the Nairobi Chief Magistrates accuses the deputy solicitor general of abuse of office and conspiracy to defeat justice. The lawyer, a former political detainee, also wanted Kimani’s future application for the position of solicitor general rejected by the Public Service Commission. Mwara was arrested and detained at Kamiti Maximum Security Prison between October 1990 and June 1992 over political activities. He later sued the State for violation of his rights. In June 2010, the High Court awarded Mwara Sh4, 749,122 as compensation. The case underscores the struggle between former political detainees and the Attorney General over payment of millions of shillings awarded as damages for violation of human rights. Mwara’s Lawyer argued that there was a representative from the Attorney General’s office once the matter came for mention or hearing and whenever they would fail the court did demonstrate patience. Justice David Onyancha said he needed time to go through the materials that the defense presented to court. The ruling on the sentencing will be delivered on June 15. 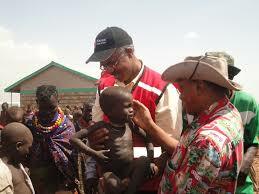 Redcross Abass Gullet attending to a malnourished child in Turkana. West Pokot County has launched a Ksh1.3 billion County Nutrition Action Plan (CNAP) to curb the high chronic malnutrition rates in the county. The county is the most affected with 46.6 percent of chronic malnutrition levels, according to the Kenya Demographic and Health Survey (KDHS) 2014 report released recently by Health Cabinet Secretary. The CNAP, which was developed through a consultative process with nutrition stakeholders, notes that malnutrition is a great public health concern in Kenya. “The country is experiencing a rise in diet related non-communicable diseases(NCDs), such as diabetes, cancer kidney and liver complications attributed to the consumption of foods low in fiber and high in fats and sugars,” stated CNAP report. According to Catherine Mukenyang’, West Pokot County Executive Committee Member for Health & Sanitation Services, development of the plan will contribute immensely towards the realization of Vision 2030, Medium Term Plan 2,national and flagship projects and Millennium Development Goals (MDGs). She also observed that the county government Act gives the counties the power, functions and responsibilities to offer services to the population. “It is said that 50 years after independence malnutrition is still a major health threat to kenya’s population especially children. Malnutrition continues to affect education, health and economy in the country” said Josephine Kachapin, the county first lady, when she officially launched the report. Mrs Kachapin also acknowledged the role of the Nutrition Champion and called on government ministries to work closely with civil societies and private sectors to see that the malnutrion burden is reduced by at least 10% by the end of the year. Kenyan security forces have repelled attempted attacks by suspected Al Shabab militants at Yumbis village of Ijara Constituency, spokesman Ministry of Interior has reliably said. Security forces on Thursday managed to deter Ugus (the group that massacres Somali people) as the group is referred to by Somali Government. The gang was sighted at around six in the evening by members of the public who alerted security forces. Security forces swiftly mobilized and engaged the militants in a gun battle. No casualties were reported. The reports comes a month after fatal attacks by suspected Al Shabab gang in Garissa University that claimed about 148 lives. The City-based Muslim cleric Hassan Mahat Omar who was earlier suspected of funding the Garissa University College terror attack which left 148 people dead has been released on bond. Milimani Senior Principal Magistrate Grace Mmasi released Mahat on a bond of Sh 2 Million and a surety of similar amount. “The court has allowed the defense application to release the accused on bail because the prosecution failed to prove that he will abscond bond terms,”said Mmasi. 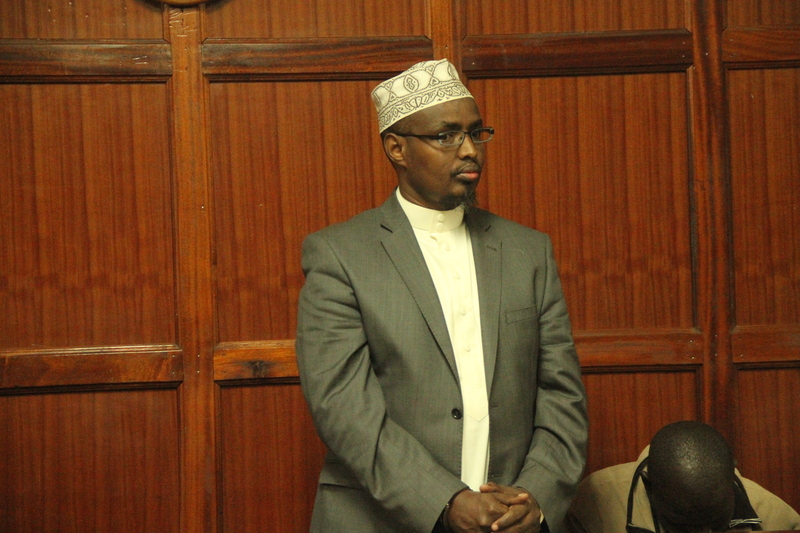 An application for bail was made on Monday when Mahat was charged in with inciting Muslims to kill non-Muslims.Senior State counsel Daniel Karuri said the accused committed the offence on or before March 6, 2015 at Al-Hidaya Mosque in Nairobi’s Eastleigh estate. He added that the kind of offense the suspect faces attracts a jail term of 30 years. He allegedly published information in a video compact disk (CD-R) named ‘Sheikh Hassan inciting Muslims to kill non-Muslims’ in contravention of the law. Defense lawyer Mbugua Mureithi requested the court to release him on bail, arguing that he was not a flight risk. “The suspect was arrested on April 17 this year and he has been in custody for a whole month, it is his constitutional right to be released on bail,” he said. The prosecution opposed the application, saying the suspect has close links with Mohammed Kuno, alias Sheikh Mahammad, alias Dulydin, alias Garmadhere, Al-Shabaab’s leader in the Juba region of Somalia and the alleged mastermind of the terror attack on the institution. He urged the court to take judicial notice of the numerous terror attacks within the country and the fact that the accused is facing serious charges. The Anti-Terrorism Police Unit requested the court to remand the suspect until the case is heard and determined. “Sheikh is a high-profile personality and is believed to be a key terrorism financier in the country,” a prosecutor said. Karuri told the court the accused has another pending case and that the charges leveled against him are serious and he may abscond if released on bail. “The police has information that the accused together with others not before the court have a vast network in the country meant to execute more terrorism attacks,” said Karuri. Karuri said his release on bail on the grounds that he was a fright risk and may abscond bail. 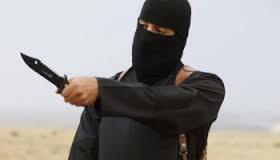 Karuri said the offense was serious and that he was a terror suspect. “He faces a serious charge of inciting Muslims to kill non-Muslims and another case of being found in possession of explosives, of which point to the involvement of the accused person in offences against the public. “We also ask the court to take judicial notice of the numerous terrorist attacks that target non-Muslims and deny him bail,” Mr Karuri said. The case will be heard on July 30 and 31.